Johnny Bench talks to media after the 'BENCH' screening at Great American Ball Park. "Thank you MLB. Thank you. Awesome job," the normally smooth-talking Bench said, as he fumbled for words after the screening. "I'm honored, I really am." MLB Network host Fran Charles interviews Bench after the screening. Later he told reporters: "I couldn't have dreamed it would come out this good. It was great! It was fabulous! It was tearful, it really was." Bench chronicles his entire career, from rare color home movies of playing ball as a kid in tiny Binger, Okla., through his two Most Valuable Player seasons and back-to-back Big Red Machine World Championships, to his National Baseball Hall of Fame induction in 1989. The show starts and ends with his life today – a single father at age 71, raising sons Justin, 12, and Josh, 9, in Florida. Cameras show him waking them up, cooking their breakfast, styling their hair and driving them to school. When Bench talked a lot about "the boys," he wasn't referring to his boys of summer Big Red Machine teammates. He means Justin and Josh, and their stepbrother Bobby, 27, who tutors the kids and sometimes babysits. Bench and son Bobby in the 2010 Opening Day parade. MR. MOM: "It's just great, and it keeps me young. I can't imagine being without these boys. They're really my life. I'm Mr. Mom." DRIVING KIDS TO SCHOOL: "It's about a 20-minute drive to school. That drive is really important to me. I really find out what's going on in their lives ... I don't think I've laughed as much as I have in the last 1-1/2 years with the boys." TRADING FOR PITCHERS SONNY GRAY, TANNER ROARK, ALEX WOOD AND OUTFIELDERS YASIEL PUIG AND MATT KEMP: "They still need a reliever. They need some guys to grow up. But this could be a magical year, quite honestly. They could win 85 or 90" (after five consecutive losing seasons). "I don't think Puig has touched his potential… We could have another MVP. We just need to stay away from injuries." Bench was National League Rookie of the Year in 1968 at age 20. LEARNING HUMILITY IN BINGER: "In 1965, I was called to the superintendent's office. He said, 'John, you've made all-state in basketball.' "
Bench immediately told a cute girl at the school, and she said, "Well, somebody had to make it!" At a class reunion years later, Bench thanked her for a life lesson: "Never expect people to be impressed with who are and what you'd done." HIS HOMECOMING PARADE IN TINY BINGER, OKLA., IN 1970 AFTER HIS MVP SEASON LED THE REDS TO THE WORLD SERIES: Bench says Binger was so small that when they held the parade, nobody lined the streets to watch it because everyone was in the parade. "Nobody is there. Everybody is in the parade," Bench says. "We made a U-turn at the police station, and waved to each other. That was our parade." Bench says Rose encouraged him early in his Reds career, saying he could hit over .300 regularly as Rose did. Bench told him, "No, you hit .300, and I'll drive you." (Bench was National League MVP in 1970 and 1972 when he led the league in home runs (45) and runs batted in (148). "We used to sit there (in the clubhouse) and say 'Thank you Pete,' because we didn't have to talk to any of those guys (reporters)." Bench and Rose also owned a car dealership and bowling alley together. 1972 LUNG SURGERY: Doctors found a "silver dollar size" spot on his right lung during the 1972 season. He delayed surgery to after the season, after he won a second MVP award and fourth Gold Glove at age 24. It was benign, but the surgery took its toll on his abilities. He never hit more than 33 home runs a season after that. Chronic shoulder pain in 1976 limited him to a .234 average and 16 home runs, but he had a great World Series hitting .533 with two home runs to win and being named '76 World Series MVP. "I wish it (lung surgery) would have never happened, so I could have had a really good career," he says in the film. 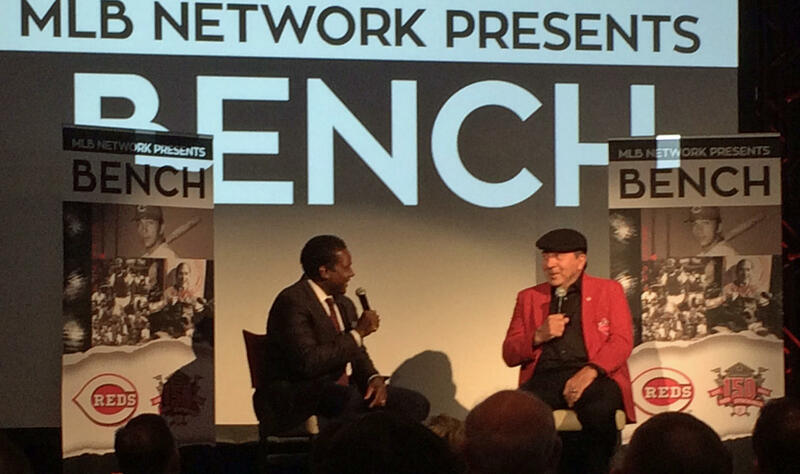 After the screening Bench said: "I never was Johnny Bench again, but at least I got to play." Bench was the 1976 World Series MVP. HIS HEALTH TODAY: He's had 17 broken bones, including multiple broken thumbs (which is why he started the trend to catch one-handed behind the plate), and about 10 concussions. He has a bad back and bad ulnar nerve. Reds team physician Dr. Tim Kremchek has removed 30 bone chips from his shoulder. He doesn't play much golf. "The warranty ran out on most of my parts." LOSING SIXTH GAME OF 1975 WORLD SERIES ON CARLTON'S FISK'S HOME RUN: When Pat Darcy came out to pitch his third inning of relief in the 12th that night, Bench instantly knew Darcy was out of gas. Bench turned toward Sparky Anderson in the Reds dugout and mouthed the words "No chance." Fisk homered on the second pitch. WINNING GAME 7 OF THE '75 SERIES: "It meant so much to be validated as to who we really were. It was pretty special." PLAYING GOLF WITH ARNOLD PALMER: "He knew how to make people feel good. I think I learned a lot that day. 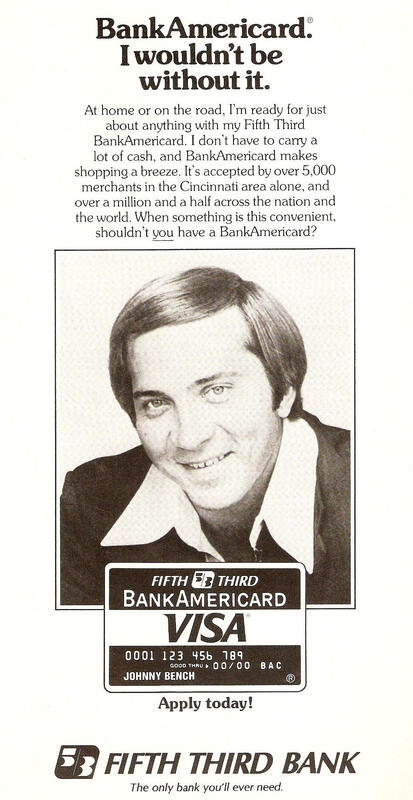 Fifth Third Bank advertisement in Reds' 1977 scorebook. RETIRING IN 1983 AT AGE 35 AFTER 17 SEASONS: "I lost it, and I'm not afraid to say it. 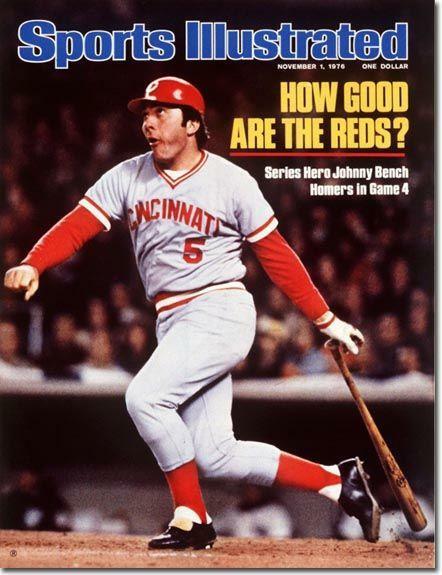 I couldn’t play like Johnny Bench." 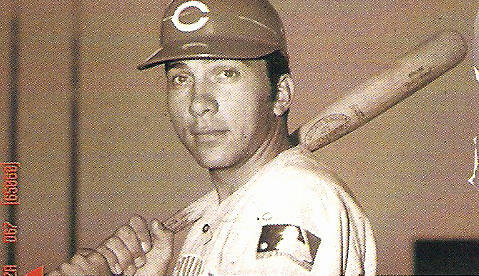 WHY HE PLAYED HIS ENTIRE CAREER FOR THE REDS: "It was probably Fifth Third Bank," where he was spokesman for 37 years. "This was a great town for me. Big town, small city." 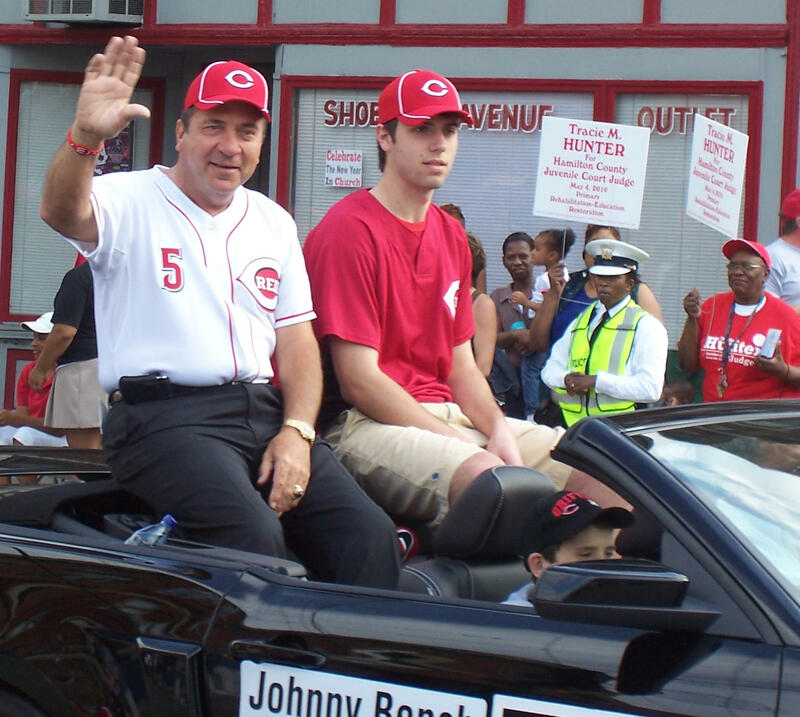 He also did Reds TV games for WLWT-TV, and had Johnny Bench's Home Plate restaurant at Northgate Mall. LUCKY GUY: "To think I got to do all of this... I was blessed. I'm the luckiest guy in the world, and MLB Network is going to do a documentary on my life!" BENCH (8 p.m. Jan. 30, MLB Network) includes comments from Pete Rose; Tony Perez; former Reds broadcaster Al Michaels; former players Steve Blass and Reggie Jackson; singer Toby Keith; retired Indiana basketball coach Bobby Knight; and announcer Brent Musburger. Watch for my review next week.